This may seem like a riddle, but having dealt with so many divorce matters over the years, I have seen too many clients intent on winning, only to wind up losers. I’ll explain in a bit. Then, just yesterday, I was trying to make space on my bookshelf for some new books I’d bought, when I caught sight of my old copy of “The Art of War” by Sun Tzu. Do you remember this book’s popularity a few years back? Practically every marketing guru, corporate manager, entrepreneur, lawyer, politician … in fact just about everyone … tried to translate Sun Tzu’s tactics and strategies into ways to stay on top of of their game. It may well be that Sun Tzu didn’t exist, as some authorities suggest, and we can’t be certain when the words were penned; but that doesn’t detract from the wisdom that this book can impart to daily life. As I looked through those well thumbed pages again, I found some interesting extracts that not only tie in with exactly what I had said at the birthday party, but align with the strategy of Simon Dippenaar & Associates. Translating Sun Tzu to the legal context, fighting equals litigating. 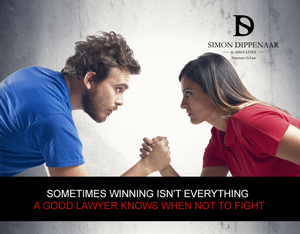 At Simon Dippenaar & Associates, part of our winning strategy is to advise clients when they should litigate, and when they should not. There’s no shortage of attorneys who will litigate at the drop of a hat, not only because it means higher legal fees, but also because they only have a shortsighted goal. Make no mistake, I am always fully prepared to litigate when it is warranted, but I believe that responsible attorneys should remain objective, and should evaluate what is really in the client’s best interests. Sometimes I have to advise clients not to litigate (even if they could win a point), simply because the repercussions could actually worsen their situation – even for years to come. This is often the case where children are involved. Children who see their parents fighting tooth and nail become embroiled in the conflict. This can significantly harm their emotional wellbeing and potentially damage their relationship with one or even both of their parents. As far as possible, I approach legal matters in a way that tries to quell the acrimony, which reduces the emotional toll on my clients. I also try to prevent further deterioration of already strained relationships, which would only be exacerbated by needless litigation. To me, this is a winning strategy. I put my heart and mind into every one of my cases. I fight for my clients’ rights, but not always through litigation. Another of my tactics is to try to settle matters out of court, as quickly and efficiently as possible. By avoiding court, one can not only reduce legal costs and avoid many of the bureaucratic delays, but can frequently achieve a better result than through litigation. Clients don’t benefit from having their matters dragged out. Only unscrupulous attorneys profit by squeezing more fees out of clients who are already in emotionally and financially difficult circumstances. I want to build relationships with my clients, not burn bridges. I do my best to finalise cases as quickly as possible, and to achieve the best results for my clients, so that they can move on with their lives. Speedy and efficient resolution of proceedings is not only beneficial to my clients, it helps my practice remain invigorated, because new cases bring new challenges, banishing the apathy that can come with having to deal endlessly with the same matters. The positive ethos results in better service for you when you need me. I have many methods and strategies I can employ to win for you, and while I will fight for you, I may not always litigate for you. I think Sun Tzu would approve.